1. A little geography lesson. The Falls are really 3: the American, the Bridal Veil (on the USA side) and the Horseshoe, on the Canada side (although my research indicated that some hold that part of the Horseshoe are in the USA). The Niagara River falls into the Niagara Gorge. The water from the gorge links two of the Great Lakes: Ontario and Erie. From a nature and geographical point of view, this is truly a natural wonder. 2. Start on the USA side. The Falls are within Niagara Falls State Park. There is a fee to park (the Empire Passport is accepted). There is also more parking within a 1/2 to 1 block radius that might be cheaper. Either go to the Visitors Center for info, or if you can't wait, follow the roar of the water and head toward the Falls. Bear to the left and take a look at the rapids of the Niagara River. The rush of the water will give you an idea of the force of the flow. When you get to the Falls, you will be viewing the American Falls from the top. You will be almost at the point where the water goes over (see the photo above). 3. Less folks in winter. But, all the attractions are closed. The Observation Tower might be free (the higher platform via the elevator was closed). In warmer weather: you can go under the Bridal Veil Falls via the Cave of the Winds Tour (on Goat Island). You will wear a poncho (but you will get wet) and special shoes. The other experience is the famous Maid of the Mist, a boat ride in the gorge (bottom) of the Falls that sails from either country. Once again, you get a poncho as part of the price but you may get wet! I recommend a nice waterproof camera. View from the Observation Tower, USA side. American Falls to the left, Horseshoe on the right. 4. 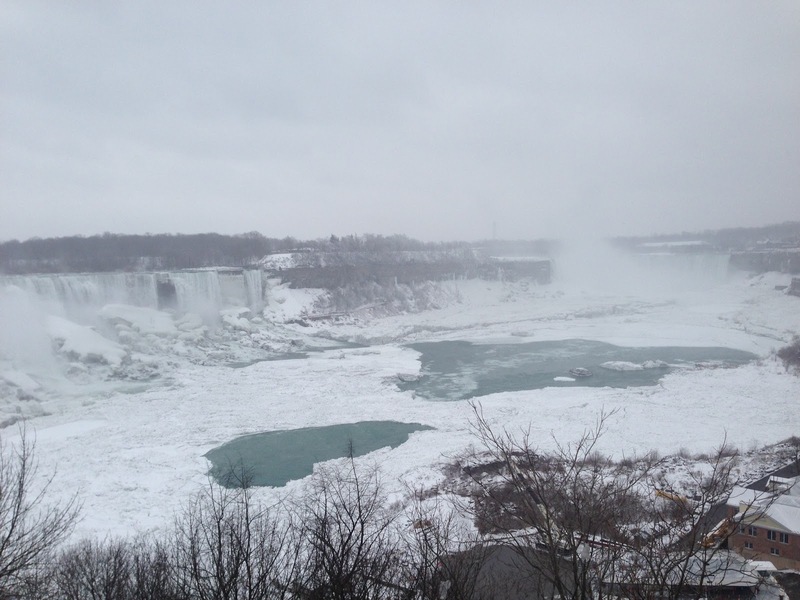 Niagara Falls State Park is worth exploring in all seasons. It's the oldest state park in the system. Check out The Great Lakes garden; hike or drive (via 1st Street) to Goat Island and then walk to the Bridal Veil Falls. Keep walking over to the Three Sisters Island. This part of the river is what goes over to form the Horseshoe Falls (the third Falls, on the Canadian side). The force of the water is amazing. Throughout, there will be restaurants, cafes and snacks, usually during warmer weather. 5. There may be construction on the USA side. There have been many new attractions and hotels added: a major convention center (up Old Falls Street), the usual gift shops and shopping, museums, wax exhibits and other attractions similar to the Canadian side. Frankly, even though many people prefer the Canadian side because of the Las Vegas-like atmosphere, I like the quiet of the American side. Next time: Part 2, the Canadian side.